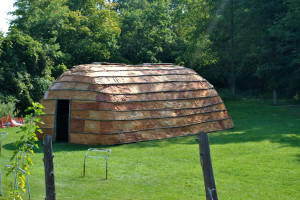 The historic record shows that each hearth was shared by two families; one family lived on either side of the longhouse. On average, families had six to eight members. 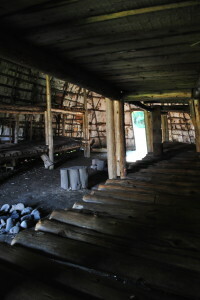 A medium sized longhouse like the one reconstructed at the Lawson site, would have been occupied by 38-40 people, all related through the female line. When a couple got married, the husband would move into his wife’s family longhouse. 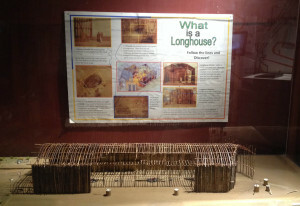 A very large portion of the longhouse was used for storage. The upper platforms would have been filled with personal possessions and a variety of food supplies such as strings of corn, dried and/or smoked fish and meat. As well, there were cubicles at the ends of the houses for storage of firewood and large pits were dug under the bunk lines for further storage of foodstuffs. In the winter months, the longhouse was the focal point of village life. Tools and other personal items were made and repaired; stories and folklore were passed on from one generation to the next and numerous social and ritual events were held. In the summer months a large portion of the inhabitants lived away from the village itself, maintaining nearby fields of corn, beans and squash. How did archaeologists know where a longhouse used to be? Small dark brown circles or stains in the ground, called post moulds indicated where the large structural poles were erected. Archaeologists look for these signs to determine the size and location of villages (such as the one found on the Lawson Site at MOA). 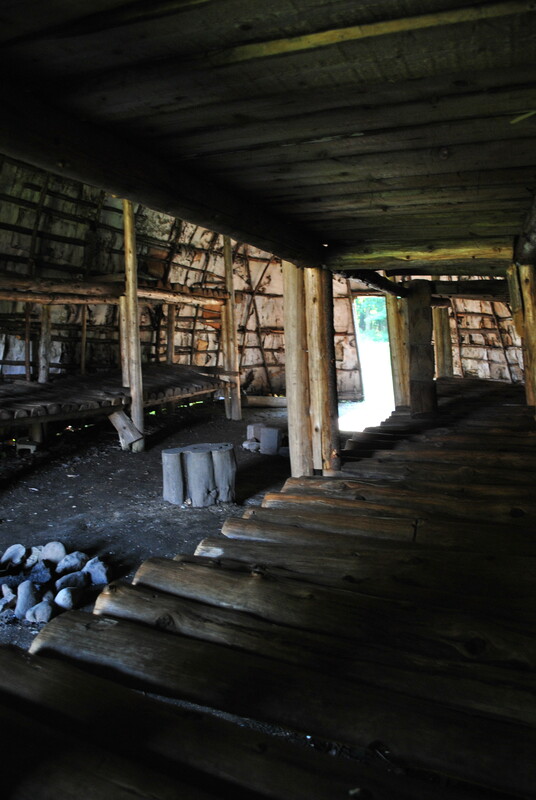 As part of your visit to the Museum of Ontario Archaeology, you can go into the reconstructed longhouse to experience life in a longhouse 500 years ago. Our educational programming is further hands on with storytelling, legends, bannock over the fire, and even cooking Three Sisters soup in the longhouse.